1) Kermorgant is suspended right when we need him the most. As Yann trudged off the pitch against Forest last weekend we all knew our big French man would be missed but it was only after Burnley headed away cross after cross in the last fifteen minutes this weekend that it became apparent just how badly we needed him. Haynes has an impressive leap and Fuller possesses good upper body strength, but neither can really dominate in the air like Kermorgant. Against Burnley, on a woeful playing surface, with our midfield low on both confidence and creativity, Chartlon largely resorted to long balls and crosses from deep when chasing an equaliser. Yet without the presence of Kermorgant up front it never looked like it was working. You can be sure that the Burnley defence would have had a lot more to think about with a bustling and bruising Kermorgant to deal with. 2) We need an anchorman. A recurring problem for Charlton this season is that we are getting overrun in midfield by teams with pacier, more dynamic and more creative centre-midfielders. In many games Powell has tried to combat this by playing Dorian Dervite in a defensive midfielder or anchorman. The problem, however, is that this is clearly not a natural position for Dervite and while he can compete in the air and offers a physical presence he doesn’t have the positional know-how to offer Charlton’s back four a solid and reliable shield. So much of being a good defensive midfielder is knowing exactly where to be at all times, about always positioning yourself between the opposition’s attack and your defence. As the acres of space Charlie Austin had to line up his shot without Dervite in sight demonstrated*, the French centre-half doesn’t have this in his locker. It should be remembered that Dervite has actually performed very well as a centre-back (he was immense away to Millwall) and is a good squad player. Andy Hughes is perhaps a better option between now and the end of the season in this role, but at 35 years of age and having just returned from a lengthy injury, he cannot be relied upon beyond that. 3) Callum Harriott is ready for the first team. He’s fast, he’s skillfull and he’s powerful. Yes there have been moments that he has looked a little rough around the edges (overhit crosses etc…) but Callum Harriott’s performances against Forest as a sub, and then Peterborough as a starter have proved to the fans, and more importantly Chris Powell that he is ready to be a first team player. 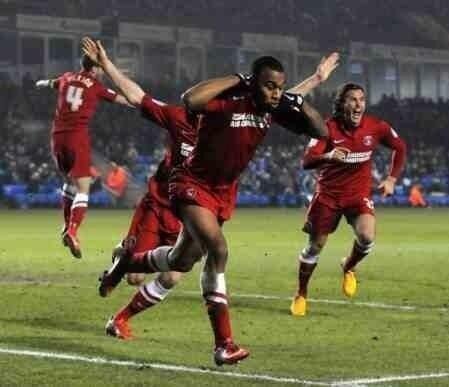 His assist for Johnnie Jackson’s goal was a wonderful piece of creativity and vision. As a number of tight looking fixtures approach, Harriott’s touch of magic could well prove to be the difference for Charlton. 4) Chris Powell is prepared to be brave, bold and ruthless. “He’s too nice” or, “he’s too indecisice” – criticism’s often levelled at our otherwise revered manager. Yet despite yet another home loss on Saturday Powell can’t be accused of these misgivings. After a series of poor and costly mistakes the gaffer was prepared to drop number one Ben Hamer for summer signing David Button who then retained his place against Peterborough. I still believe that in the long term, Powell regards Hamer as his no.1, but he has sent a message to the rest of the squad that if standards aren’t met then there will be consequences. Furthermore, Powell was prepared to experiment with his tactics by lining up with a 4-3-3 against Burnley. In hindsight, Powell may have judged his selection as a step too far – although we looked far more threatening than we did in the previous home fixture vs Forest, our players were not suited to the formation and the switch back to 4-4-2 was duly made in the second half. Without a natural anchorman our full-backs couldn’t safely bomb forward as is required in a 4-3-3. Furthermore, our front three was made up of three players best deployed as a centre forward who all looked slightly confused as to what they were supposed to be doing. 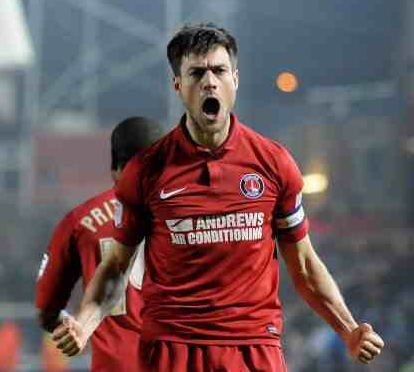 Some Charlton fans have criticised Powell for going with a 4-3-3 yet there are undoubtedly positives to be taken from it. It is now clear that the formation is not suited to our squad, and it should be canned until next season and the arrival of new additions to the squad. But we should be pleased that our young manager is prepared to go outside of his the comfort zone when it comes to tactics. Not only will this see him progress as a tactician as he learns the pros & cons of different formations, it shows us that we don’t have a tactical dinosaur incapable of seeing beyond a traditional 4-4-2 in charge of our club. One only has to look at the example of Swansea to see that being brave enough to play with different formations in the Championship can have startlingly beneficial effects in the long term. *As highlighted by JJCAFC’s excellent comment on the Player Ratings. This entry was posted in Blogs and tagged 5 Things, Andy Hughes, Burnley, Callum Harriott, Charlton, Dorian Dervite, Peterborough United, Yann Kermorgant. Bookmark the permalink. I’ve lost count of the number of goals we’ve conceded post Curbs because we don’t advance away from goal once a clearance has been made. If the back four had been moving towards the ball both on Saturday and last night, so called unstoppable wonder strikes may have been blocked. Sorry for the late reply Brad, but I agree that this is a long running problem.